It is with sadness that I write these words about our friend, Royce Kent Crawford, a member of the BY High Class of 1959, one year ahead of me. But there seems to be no one else to write about this memorable alumnus. Royce Crawford was born at Provo, Utah on December 20, 1941. 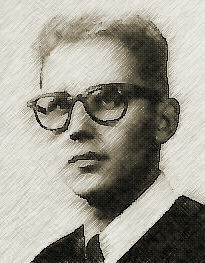 Royce Kent Crawford passed away on September 4, 1991, at the age of 49. He had been admitted to the Utah Valley Regional Medical Center in Provo Utah, due to some sort of sudden illness. Kent, as you know, we first met at BY High in 1957. I know that you were interested in electronics and model airplanes, as I was. You were also interested in dance, particularly ballet. I watched you glide across the College Hall stage during assemblies, wearing black tights and a black turtle-neck sweater. You had the strength to gracefully lift the girl dancers high into the air. First, you told me that because you liked me so much, you were going to change your name to my name (a very improbable choice). You said that you wanted to be known as "Kent Crawford" instead of "Royce Crawford." Second, you were present as a witness at the scene of my first automobile accident. I had been driving for only about a month, and had just dropped you off at your house after school. Two older women driving a big pink ’56 Cadillac were looking at each other, instead of at me, and they crashed into the back of my car. It was actually my mother's car. The impact crushed the car right up to the back of the rear seat. I received a severe whip-lash injury to my neck that still gives me trouble today. You saw the entire crash from your front sidewalk, just a few feet out of harm's way. You looked pretty shocked and concerned, and that helped reduce the shock for me. Later I was puzzled, along with my whole family, when you told us that you needed to get away from Utah and the influence of the prevailing religion. We tried to understand and silently wished you good luck as you left us to pursue your dreams of working in the theater and writing plays in California. In 1969 you made a memorable visit to my young family's small house in Provo. You showed up wearing black Levi pants, black boots and Buddy Holly sunglasses, combing your curly black hair as we opened the door. You looked just like a character out of a 1960s movie. Your stories about your experiences in California, told in “hip” talk, fascinated my two small boys, and perhaps burned their ears a bit. From then on, for years, each time the doorbell unexpectedly rang they shouted “It's Crawford! It's Crawford!" You came to see us about eight times in the twenty years between 1969 and 1989. Each time you came, our children had grown up some more. Your latest experiences always sparked their interest. We could tell that you really wanted a family of your own. Several times you told us that we were your "only friends" and that made us feel privileged but also sad. On one memorable visit you came with your new wife. You were both so happy. You always came alone after that. We are sorry that you left upset, with colorful language and squealing tires, several times. You see, children really do say the craziest things. You have to cut them a little slack sometimes. They are simply in need of some more life experience and maturity. We still recall the last time you came to see us, in 1989. 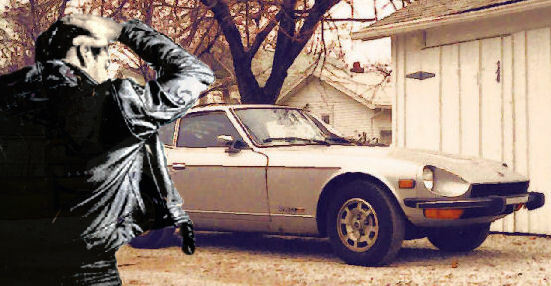 You drove into Rye Circle in West Jordan, Utah, in your old 260Z. We helped you open the hood that had been stuck shut. You left upset at something again. You never came back. During the next year, I believe I caught glimpses of you walking alone on the streets of Salt Lake and Provo. Unfortunately, each time I was in a hurry, and didn’t stop. I got the feeling that you were very lonely. You didn't seem to have an automobile anymore. You left this world so quickly. We waited and waited for fourteen years for you to come back and turn our world upside-down again. Ryan, Greg and Mark kept looking and looking for you. We wanted to tell you some things to make you happier. We hoped to make you laugh again, and to hear your latest experiences. After all, that is what friends are for. So we were shocked and sad to learn that you left this world all alone so long ago, without even a note in the newspaper. We wish you had told your "only friends" that you needed help. We want you to know that the friends that you came to visit, and your BY High classmates, will always remember you. How could we ever forget you? And we want to make sure that none of our other classmates from BY High ever feel alone and friendless.